Stumptown French Roast Whole Bean Coffee - 12 oz. Please login or sign up to add products to your order. Flavors of clove and bittersweet chocolate bring layered flavors within a classic dark cup. Each component of this dark French Roast blend meshes perfectly to create a balanced and full-bodied coffee. After each sip of this toasty blend, you will be greeted with big and smoky flavors. Roasted to absolute perfection, the beans are removed immediately after the second audible “crack” is heard. This is the sound that lets roasters know the beans have reached the maximum amount of heat that preserves flavor. You’ve never tasted a dark roast like this. Decadent, ultra-moist coffee cake with a melt-in-your-mouth crumbly streusel. A splash of our half and half will add richness to any dish. Four pack of traditional New York-style kettle boiled cinnamon raisin bagels. Rich and gooey spiraled rolls loaded with cinnamon and iced with cream cheese frosting. We've been getting this coffee for a while and it's a great way to start the day. We use it with both a French Press and AeroPress - just adjusting the grind to make it work. 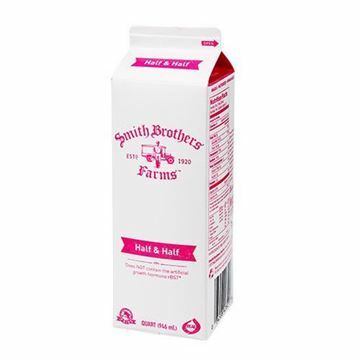 Copyright © 2019 Smith Brothers Farms. All rights reserved.